“When two monitor displays are properly calibrated, shouldn’t they be exactly the same in terms of the colors and, reasonably speaking, the brightness they produce for a given image? Many times two monitors made by different manufacturers will both be calibrated properly but look different from one another. How can this be? If you are interested in reading the entire Zenfolio Blog Post, you’ll find it here. You can register for this webinar here. 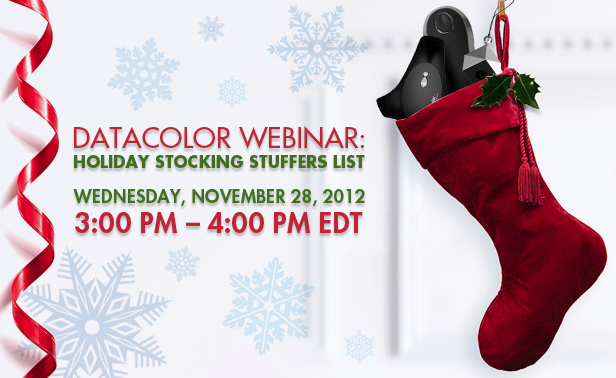 There will be a Datacolor Spyder4Pro given away to a participant at each webinar (no reindeer required, we’ll ship it to you), and there are sure to be some excellent specials offered as well. Think about that, specials, stocking stuffers, you might want to attend and put some of this information on that gift list you hung on the refrigerator, to be sure the elves are effective this year. Please sign up for this webinar today, before the holiday distractions undermine your short-term memory. I’m looking forward to the more festive and less formal format of this webinar, I hope you’ll join us. Here is the link on Phoozl to read more, to see the winners, and to read the critiques of them. Thanks to Harald Johnson for inviting me to participate in this PhoozL event. On Tuesday, Nov 20, I will be presenting an introductory webinar on Videography and Color Management for Video, intended for photographers who are considering moving into motion shooting. David Saffir will co-host this webinar, sponsored by Datacolor, as part of the Datacolor webinar series which David and I have been hosting this year. You can read more about this webinar and register here. There will be a Datacolor Spyder4Pro given away to a participant at this webinar, and there are likely to be some excellent specials offered as well. Sign up soon to reserve your space; these webinars have been increasingly popular and there is a risk of this one filling up. Cinema Lenses; What’s the Big Deal? Standard DSLR lenses of the type you already own for your DSLR cameras work quite well for shooting video, both with DSLR bodies, and with the next step up: Cinema cameras such as those from Black Magic and Camera Red, if the lens mounts are compatible. 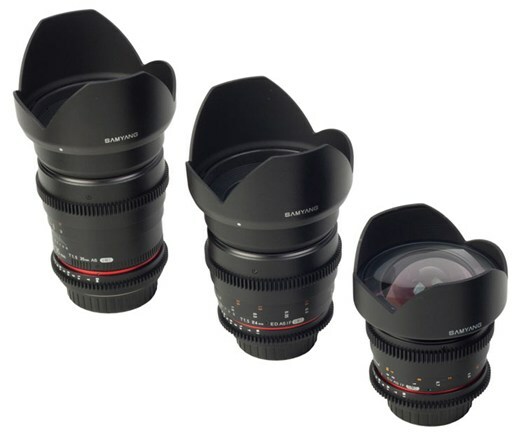 However there are also dedicated cinema lenses designed specifically for shooting video. This may leave you wondering just what is unique about these lenses, and why might you consider acquiring one or more of them. The list of advantages of Cinema lenses over their DSLR brethren is relatively short, and the justifications may sound minimal as well; but they may add up to justify adding one or more dedicated cinema lenses to your collection, if you find yourself shooting an increasing amount of motion. Keep in mind that there is a flip side to this coin: dedicated cinema lenses may not be as convenient for still photography, and may best be thought of as motion-specific. And a final caveat: as the major DSLR manufacturers move forward, they will be keeping their eyes ever more closely on the motion category, so newer lenses from them are likely to offer increasing optimization for video work, while still being eminently usable for still imaging; so with the exception of any areas where there is an unresolvable conflict between the two, future DSLR lenses may well be optimized for both. The adjustment rings on DSLR lenses are typically ridged, for positive grip when rotating them. However those ridges are not usually in the form of standard 32 pitch geared rings. This means attaching any type of follow-focus or follow-zoom device will require trusting a friction band (read: rubber band) or installation of a third-party geared ring for use with standard motion rigs. Cinema lenses tend to come with gear rings already in place. It will be interesting to see if any of the major DSLR manufacturers come out with finger friendly rings with a soft-surfaced 32 pitch gear ring as the standard ring on dual purpose lenses, or at least provide an easy add-on geared ring system. Most DSLR lenses do not offer an aperture adjustment ring. And not all cameras will communicate with all internal aperture adjustment methods. Moreover, in the rare instance where a shot requires, or at least would benefit from, changing the aperture during the shot, a lens without an aperture ring won’t allow this. Also, even when DSLR lenses include an aperture ring, it typically incorporates “clicks” meaning it only offers incremental settings, on a scale such as a third of an f:stop. Cinema lenses often offer “unclicked” rings, allowing for exactly the setting desired, even between typical settings. And the lack of “clicks” is also important to smoothly adjusting the aperture during a shot. Cinema lenses are designed with full manual adjustment of functions; DSLR lenses often use internal, automated, methods of making adjustments that can interfere with cinema uses – especially those uses that require adjustment during the shot. Cinema lenses often offer a longer throw; meaning the ring rotates farther around the lens, sometimes close to a full revolution. This might not be convenient for adjusting a DSLR lens quickly for still shooting, but allows for greater precision in focusing a cinema lens for motion work. Many DSLR lenses continue to rotate even when they pass the optics minimum or maximum points; they have no hard-stop at the end-points. This means that adjusting past the end point invalidates any fixed points that may have been set in between. So there are no absolute locations in the ring rotation matched to a specific zoom length, focus plane, or aperture setting on the ring. Dead stops at each end on cinema lenses eliminate this issue, and allow a selected value to be returned to easily, by rotating the same amount in the reverse direction. On DSLR lenses markings are often on the top of the lens, and oriented towards the body; this makes sense if a photographer is most likely to pivot the camera up, and look at the settings from behind the camera. However, in video rigs the camera is often fixed in place on a fairly large rig for shoulder “steady-cam” holding, or on a large tripod-based rig. In such situations, the most convenient way to view the lens settings are usually from the side and horizontally. So it’s no surprise that cinema lenses tend to be marked horizontally, from the side; instead of perpendicularly on the top. A small difference that adds up over time. Another difference between Still and Motion lenses is that Cinema lenses are often marked in T-Stops, not F-Stops. F is for Focal, T is for Transmission. It can be thought of as the same as the equivalent F value, but normalized for whatever light the lens in question fails to transmit. So two different lenses marked with F-Stops may produce slightly brighter or darker results, if one transmits more light than the other. For T-marked lenses, any two should match, even if their transmission ratios differ. This is handy when shooting a scene with multiple cameras using different lenses. With zoom lenses, DSLR lenses tend to lose focus as zoom is changed, which requires refocusing (or continuous autofocus adjustment) to capture the same item in focus at differing zooms. For motion, this is a problem, as it is a common type of shot to keep a person in focus while zooming in for a closeup, or out for a context shot. Most Cinema lenses are designed to be parfocal, meaning they retain focus while zooming. When the focus of a lens is changed, the apparent zoom changes. With DSLR lenses this effect tends to be quite noticeable, as it is not critical for still imaging. For expensive Cinema lenses, the effect is less apparent. Lower cost Cinema lenses may not improve this effect. Most other variations are specific to one or another lens, including issues such as sharpness, speed, bokeh, and build quality, so it is not possible to generalize about them. Even price does not always lean in one direction; while there are many cinema lenses that cost more than standard DSLR lenses, it is also possible to find dedicated cinema lenses which cost less than their DSLR counterpart, but which still match many performance features, since the lens is targeted to that specific use. The information in this article should assist you in determining if you are ready to move up to dedicated cinema lenses; or if you are best served by multipurpose lenses that also work well for your still shooting. Keep revisiting the issue (and possibly this article) as your motion work increases, to decide when, or if, you are ready to make a move to dedicated glass. I was recently involved in an interaction on a photography list where the CEO of a non-profit posted a note asking for images, and full usage rights of those images, for free. This is becoming a more and more common technique for searching for photographic content. Professional photographers, and particularly photojournalists are being progressively replaced by end user images. 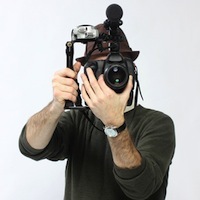 Current Event Photography is being, effectively, crowd-sourced. This is an inevitable result of digital technology. Digital has undermined most, if not all, areas of photography, not just photo journalism. But where should the line be drawn? What is the ethical component of knowingly attempting to get images for free, when the sources for purchasing them are right in front of you? There is no single answer, but the question is worth pondering. “Hi, I donate my time to a non-profit organization which is attempting to achieve (insert description of worthwhile goal here). We are looking for photos or video footage showing (insert topic here). We cannot afford to purchase such images and footage from Getty, Corbis, or individual professional photographers, which we would prefer to do, if funds allowed. Since we can’t afford that, we are soliciting images and footage as a charitable donation in-kind. In order to use images, we would need a signed document, a blank copy of which is included below, assuring us that rights to the images belong to you (so that we do not infringe on the rights of anyone else, if the shots are not actually yours) and assigning us the limited rights for use that are described in the document. 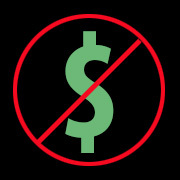 These are the minimal rights we would need for the uses we have planned, and we would recontact anyone supplying images under these terms if the situation changed and further rights were needed. Since we are a 501c3, while we unfortunately cannot compensate you for your work, we can at least provide you with an in-kind donation receipt. Full credit will be given in print or on screen, for all images and footage used, including a URL, if the photographer includes one. Include Personal Contacts so people can see you are actually available, ideally including an organization email address, so that they can see you really work there, instead of being an outside resource. Appropriate contract included here, so that the actual terms can be seen up front. Include what YOU promise to do (image credit statement, recontact for extended uses) as well as what THEY are signing away in the document. I will be interested to hear people’s views on this issue. Note: I am republishing this article, as it pertains equally to the new Retina Display iPad Mini, which shares similar screen color with the non-Retina version. There are not too many surprises with the fourth generation full size iPad (wouldn’t it be great if Apple gave these products functional names?). Its largely a refresh for the sake of updating the processor and moving the connector system to the new Lightning Connector. Both worthwhile improvements, but not anything to concern us here. Still, there are more questions to be considered with the new iPad mini. The screen of the iPad mini offers the pixel-count of the pre-Retina iPads, in a smaller form factor. Not retina resolution, but somewhere in between the non-Retina full size iPads, and the Retina versions, by way of its decreased screen size. Many will choose to live with this enhanced, but not “Retinaed” resolution (yes, I just turned Retina into a verb) in return for the convenience of the smaller form factor and the lower price of the new mini. But what about its color characteristics for serious uses? Has Apple taken a step backwards there as well, in order to make the new mini more cost competitive in its (already populated) size range? The answer is yes, and no. As we know from previous testing, the Retina iPad screens (and the iPhone 5 Retina screen as well) have been updated from the earlier, twisted, sub-sRGB color space of early iOS devices, to a color space very close to sRGB. The gamut plot below shows the iPad 3, with sRGB overlaid, as that order provides the clearest indication of their match. The green primary of the iPad 3 actually exceeds sRGB by a bit, but overall this is a great match. We have also studied the gamut of earlier iOS devices, and seen how this gamut effects their display of web images (in sRGB) and web videos in Rec-709, which shares a number of key characteristics with sRGB. The image below is the second generation iPad, overlaid on the third generation iPad, showing the smaller and twisted gamut of the earlier screens. There is no doubt that the color accuracy of the sRGB-sized recent devices is superior to the older devices. 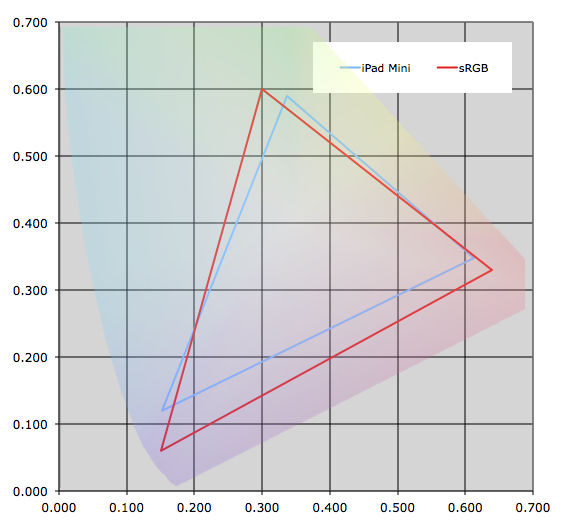 With that background information in mind, lets look at the gamut of the iPad mini in relation to sRGB. First, its important to note that the white point (global color tone) of the iPad mini is close to the target value of 6500K, and the gamma (ramp from black to white) is very close to the target value of Gamma 2.2. 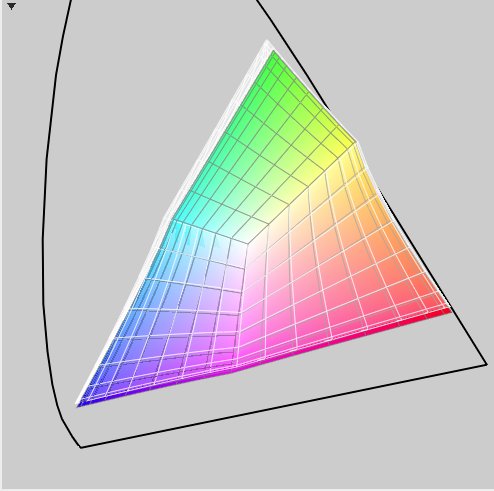 In the image below, you will recognize the earlier, sub-sRGB gamut, and twisted primaries, with the added twist of primary green, and well as primary blue, being offset sufficiently from the sRGB primaries to lie outside of sRGB, making color correction that much more difficult. 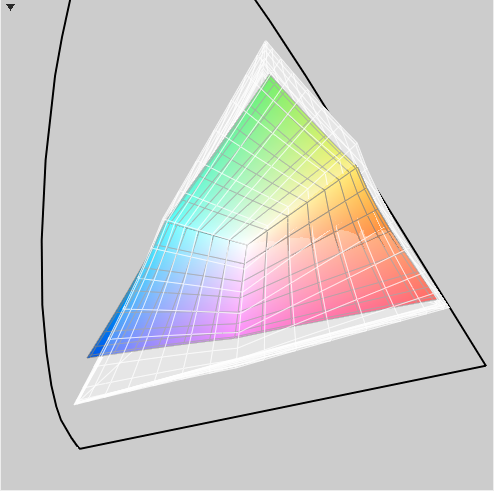 Yes, this gamut looks quite familiar, as you can see by comparing it to the previous illustrations. The iPad mini does indeed revert to the smaller, twisted shape of the earlier iOS gamut. Apple seldom takes a step backward in their relentless move forward, but here we have one example of it. So, if you were considering getting an iPad mini for use as a photo or video portfolio, please note that these color deficiencies will effect your results. It is quite likely that in the next generation of iPad mini, Apple will move the device forward to a full sRGB gamut (and who knows, perhaps Retina resolution as well). So at this time the larger gen 3 and gen 4 iPads are the optimal iPads for display of critical color. It is possible to color calibrate the iPad mini with Datacolor’s SpyderGallery application, to produce corrected color (within the limits of the reduced gamut) in the Gallery viewer, or in other Apps if you launder your images through SpyderGallery. But for color critical uses, it may be worth holding off for a generation, to see what Apple has up its sleeve next time for the iPad mini.